Photo by EPIC Photography Inc. It takes time to build a legacy. Since 1952, Spalding Hardware has been striving to do just that. Through hard work, dedication to customers and providing quality products, Spalding Hardware has established a solid reputation in the construction industry. 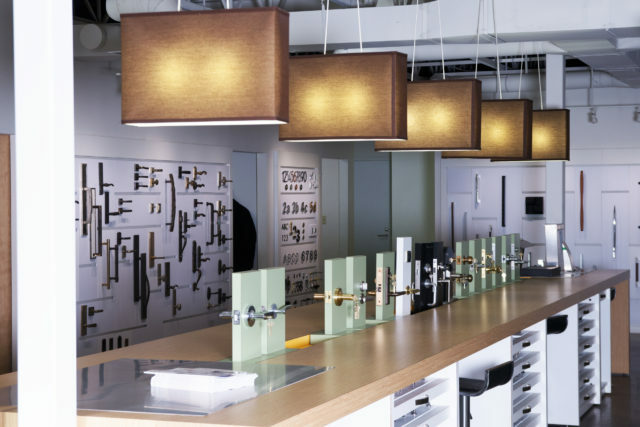 Over the past 65 years, Spalding has evolved from builders and general hardware in Calgary and Edmonton into a high-tech company that provides everything from doors and hardware to site assessments and access control. Spalding has broadened its scope and changed its business model over the decades. When John Manes and Ed Toy joined the company in the early 1980s, one of their divisions provided general hardware supplies like sandpaper, screws and glue to lumber yards. With the introduction of the big-box stores, this became a less competitive enterprise so after the pair became owners, they looked at making significant changes. “We had an opportunity to buy the business in 1994. The economy wasn’t great and it was a bit of a risk – putting up our personal property to take that leap, but we did it. And I’m certainly glad that we did,” says John Manes, president and CEO of Spalding Hardware. As Manes and Toy took over the helm, they steered the ship in a different direction to reflect the needs of its customers and the changing industry. Within a few years, they shut down the general hardware division and transitioned those employees into something completely new. 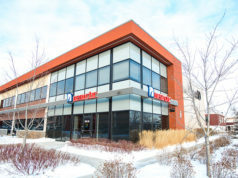 The aftermarket division complemented the construction side by providing service to customers over the life of that building. As clients’ needs have changed or hardware components have worn out, the aftermarket division has been available to maintain the product and support the customer. This type of diversification has been key to helping Spalding Hardware ride out the several economic downturns it has experienced over the decades. This isn’t the only innovation the duo has introduced. 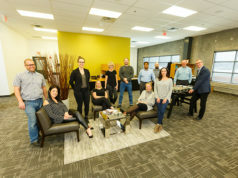 The Calgary and Edmonton branches each has a showroom to showcase designer-driven product to professionals in the industry as well as to private customers looking for something unique for their custom home renovations and builds. Spalding also boasts an on-site fabrication shop in each city that allows them to do on-the-fly custom door and frame fabrication for smaller projects. “Every project needs something different so it’s not a cookie-cutter business for sure,” says Manes. In fact, the business is the furthest thing from cookie cutter. Today’s company has evolved beyond simply doors, a few hinges and a mechanical lock. The industry has become increasingly high-tech, and Spalding prides itself on staying abreast of the latest advancements in technology. The company offers the best in access control and automation technology and ensures the staff is well trained to support and install these products. And as products have become more complicated, installation has become more complex. Gone are the days of a generalist being able to throw up a door during a build; now it is a specialized and technical process that requires skill and training. Clients look to the Spalding team to handle all the openings installations to ensure everything is wired and put in place properly. Technology and electronics are big components of today’s openings business. Products are geared toward providing security while continuing to meet the life safety and barrier-free code requirements. Spalding Hardware offers exit devices (or crash bars) that are designed to aid in evacuation in case of an emergency. These components light up and sound an alarm, either with sirens or a voice directing people toward the exit. The company also offers fire doors and hardware assemblies that help contain a fire and compartmentalize a building, which helps to protect first responders. The focus on security has also filtered into institutional buildings like schools. Spalding helps schools incorporate systems that protect students and teachers from an internal or external threat while ensuring they can still get out safely. Spalding further accentuates security with the introduction of access controls into the door design. Different businesses have different needs, and Spalding doors can have card readers for access, automatic operators and sensors to ensure the openings function as they should. “The challenge is how to make different technologies work together and also meet fire code, meet security and be trouble-free for the owners,” says Toy. Trouble-free is Spalding’s specialty. All 50 of the knowledgeable professionals at the company live by the 65-year-old philosophy of providing the best customer service from start to finish and standing by their product, no questions asked. Their motto is “We give you peace of mind” and they deliver upon that promise by always being there to solve any challenge, whether that may be advice about which option makes the most sense in a space or fixing an issue with a component. Service has always been key, and it has remained consistent as Spalding enjoys very low employee turnover. Management offers flexibility to accommodate life-work balance and personal circumstances while promoting an atmosphere of respect and compassion that flows from the top down. In turn, employees respond with hard work, pride in their jobs and an investment in the success of every project. And as many employees have been with the company for more than 10 years, with some at 20 to 30 years, customers are confident the service and product at Spalding Hardware is stable and reliable. With such a high level of experience and expertise at Spalding, the company has established itself as a leader in the industry. The company’s professionals are sought out by architects for design assistance to help them figure out what is needed during the initial stages of the process. They are also consulted throughout the build to ensure any changes made still adhere to both the design and safety codes. Manes further assists architects by hosting “lunch and learns” to help them better understand the scope of this area of construction. His aim, though, is to educate, not to hawk product. “I’m not a salesman. I don’t go in with a bag of doorknobs that I want them to buy. I talk about the process and how you apply the best solution,” says Manes. After all, the business is all about finding the best solutions to problems. Spalding taps its network of quality suppliers, many of whom have worked with Spalding for several decades, to ensure customers have access to the best choices from the best products on the market. They determine exactly what customers need – whether that’s having a door with card access or sensors or security features – and present the best options to clients. Options, however, can be overwhelming, even for architects and contractors who work in the field. Spalding is happy to whittle it down to the most fitting products for the project, budget and requirements and allow clients to choose from there. And the result is a portfolio of fantastic projects. 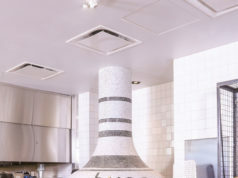 Spalding has been involved in several noteworthy projects in both Edmonton and Calgary. After the 2013 floods in Calgary, Spalding was called in to help get the Scotiabank Saddledome up and running again in an incredibly short time frame. Being the original supplier to the project, Spalding had all the information and expertise to hit the ground running and was able to seamlessly restore the doors, frames and hardware after the disaster. The South Health Campus in Calgary was another enormous undertaking with more than 5,000 openings that required card access doors, automatic doors and specialty products for OR suites and X-ray rooms. Spalding provided design-assist services to the architects and worked with the designers, engineers and end users to ensure the project met code as well as the client’s needs. “Hospitals really put all of our skills to work because they are very complex, specialty openings,” says Manes. Spalding was also responsible for developing the hardware and door security for Eighth Avenue Place in downtown Calgary, where they made sure components met code while enhancing the esthetics of the building. In Edmonton, Spalding completed the openings in the iconic Edmonton Federal Building renovation. They provided the hardware and security interfaces for the art deco building, taking pains to update it for function while allowing it to retain its historic character. The company also just completed one of the towers in the ICE district that is home to the City of Edmonton offices and is currently working on the new Centre for Performing Arts at Grant McEwan University. Even after 65 years, each project teaches the professionals at Spalding something and gives them motivation to continue to get better. It also motivates them to continue to build up and support the industry and the surrounding community. Manes has served as the president of both the American and Canadian arm of the Door and Hardware Institute and Spalding is also a member of the Calgary Construction Association and the Edmonton Construction Association. With his focus on training and awareness of safe and secure buildings, Manes is also the current president of the non-profit organization the Door Security and Safety Foundation. Outside the industry, Spalding Hardware has supported various causes over the years including Renfrew Educational Services, Project Angel and Edmonton’s Ronald McDonald House through both product donations and fundraising support. While this year’s important milestone has given Manes and Toy an opportunity to look back on all they’ve accomplished in the industry and beyond, it is also a chance to look ahead at the future of Spalding Hardware. “We will be pushing in new processes, new ideas, new things that will help our customers and make us even more efficient,” says Toy. Spalding is working toward becoming a more lean company by streamlining its processes to minimize both environmental and time waste. Management is also involved in implementing lean thinking into the construction industry as a whole, and it uses its lean procedures to attempt to ferret out the inefficiencies in other stages of the job. At the same time the company is dedicated to continuing to provide the best, most advanced products on the market. Spalding is a leader in these areas and is always looking at ways to change how it does business in order to better serve customers. But even with all the changes it has experienced over the past 65 years, the company’s level of service and dedication is one thing that will never change. “If you keep your level of service above industry standard you’ll always be around,” says Toy. The next generation is poised to step in to ensure the company will indeed always be around and to protect the legacy that decades of hard work has built. The owners have spent more than three decades on day-to-day operations and are now stepping back and looking at succession planning. Manes and Toy are grooming Manes’ son Josh and a group of talented young managers to one day take over the responsibility of building the company and growing that legacy. They will be tasked with carrying on the high standards and strong relationships with suppliers, customers and staff into the future. “We wouldn’t have survived this long without our business partners – our customers and suppliers. We are looking at the next generation coming in and hopefully in the next 65 years we’ll continue to grow and be as relevant in the market as we are now,” says Toy. With its forward-thinking, amazing products and dedication to customers, there’s little doubt Spalding Hardware will be a leader in the industry for generations to come.